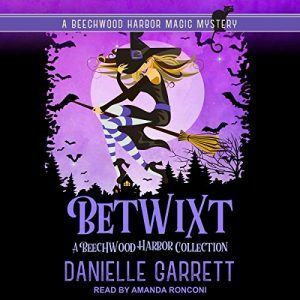 Betwixt is a fun anthology and written so that those who haven’t read the series can also enjoy it. For all but the final story, there are very mild spoilers for the series, but nothing more than if you’d read the book blurbs for the series books. Other than a few minor discrepancies, I found the stories entertaining and enjoyable. I like how there is an introduction from the author before each story, giving background info and where it fits chronologically within the series. Narration: I’ve been listening to Amanda Ronconi read this series for a half dozen books now, and she has consistently done a wonderful job. With the first person POV, the narrator is the main character, and Ms. Ronconi’s charm adds much to Holly’s personality. Ms. Ronconi convincingly portrays Holly’s thoughts, concerns, and expressions, making the character feel real. While Ms. Ronconi provides little difference between the male characters’ voices, the tone is deeper and fitting. Her female voices are each a bit different and well-suited. She also did a great job when characters other than Holly take the lead. Prequel to the series when Holly still lives in the Seattle Haven and Gabriel is already in jail. This is the story of how Holly was kicked out of the Haven and came to live at the Manor. We already knew the basics, but getting the details was fun. Shortly after Holly moves in to the Manor, she and Adam discover a dead human at Lacy’s vampire Halloween party. It was fun to watch the pair try and keep the death a secret while attempting to solve the crime and keep Lacy in the dark. This one takes place after the series has started and all of the main characters are established. Little is done to introduce new characters (that haven’t yet appeared in the anthology), so first-time listeners may be a bit confused. Great day-in-the-life look at the manor when its residents are not in the midst of danger. Takes place after book 5 when Holly has finally cleared herself of the issues hanging over her head. The story introduces Scarlett, the resident ghost whisperer and Flapjack, her ghostly, talking cat, while kicking off a spin-off series. I love how much the residents of the Manor care about their ghostly matron, Posie. One comment on the narration, Holly and Scarlet have very similar voices. This is the first story told from Scarlett’s POV. It’s a Christmas novella, and there is an evil elf giving kids nightmares. Scarlett and Holly team up. I enjoyed them working together and hope the main series has more of it. Fun short. This goes a bit back in time to when Holly is in school and meets Boots, her familiar, for the first time. It’s short and cute, with a bit of foreshadowing. Fans of the series will enjoy. Told from Nick’s POV, this is the only story with major spoilers if you haven’t read through at least book 5, Lucky Witch. Time has passed and Nick’s losing money due to lack of clients. It’s another fun adventure with Nick in the lead now and he’s knowledgable of the supernatural world. I like that the mystery is just an everyday small-town mystery. I loved seeing the group work together. OVERALL Thoughts: Very enjoyable, especially for fans of the series. I do recommend reading this one after book 5, Lucky Witch. Betwixt is a collection of the in-between. Catch up with Holly and Scarlet in these stories of the mischief and mayhem they get themselves into while you wait for the next full-length novel. Each story has a special note from Danielle that helps navigate where the story or novella fits in the timeline and special background information.